Greek campaigning ends ahead of vote Jump to media player The BBC's Chris Morris reports from a Syriza rally in Crete as campaigning in Greece's general election comes to an end. Syriza splits electorate as vote looms Jump to media player The people of Greece go to the polls on Sunday in one of the most crucial general elections in the country's history. Final countdown to Greece election Jump to media player Ahead of Sunday's Greek general election, Chris Morris reports from the town of Drama in Greece, where there is discontent with the ruling parties. 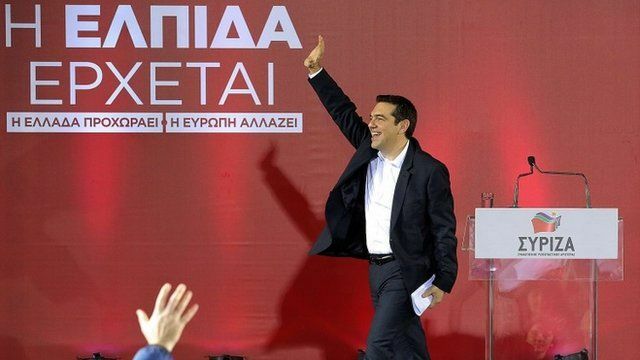 Is left on verge of power in Greece? Jump to media player Thousands of supporters of the radical left-wing party Syriza have been taking to the streets of the Greek capital Athens. Will Greece leave the eurozone? Jump to media player Germany would be prepared to let Greece leave the eurozone according to remarks reportedly made by Chancellor Angela Merkel. Campaigning in Greece's general election has officially come to an end - voting will take place on Sunday. The leader of the Radical Left Coalition Syriza, Alexis Tsipras, spoke to a crowd of supporters on Friday evening on the island of Crete, from where the BBC's Europe Correspondent Chris Morris reports.